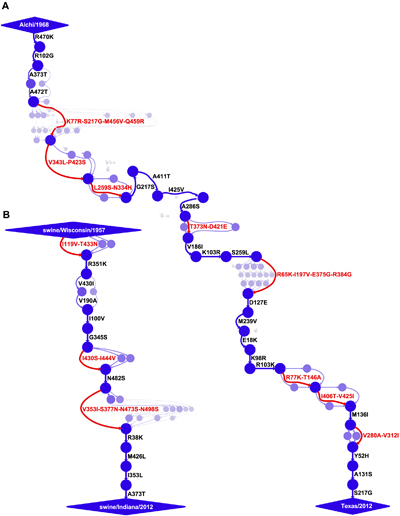 Mutational pathways of (A) human and (B) swine influenza nucleoprotein. Circles represent unique protein sequences, with their areas and color intensities proportional to the probability that the sequence was a step in the pathway. Epistasis is a phenomenon in which the effect of one mutation depends on the presence or absence of one or more other mutations. Biologist John Maynard Smith used a word game to illustrate how epistasis constrains the evolution of a protein. In this word game, a new word is formed by sequential single-letter changes, the stipulation being that each intermediate is a word: WORD -> WORE -> GORE -> GONE -> GENE. In this analogy, certain substitutions, such as R -> N to form GONE, must be preceded by others: D -> E and W -> G. Without both of these prior substitutions, nonsense words WOND or WONE would be formed by the R -> N substitution. Thus, these prior substitutions are considered epistatic to R -> N. An understanding of epistasis is essential to evolutionary biology, as it may shape evolutionary pathways and patterns of sequence change. Extensive experimentation has revealed that epistasis is prevalent in adaptive evolution, during which a population undergoes changes to improve its fitness in response to a given environmental pressure, exemplified by the emergence of drug resistance in bacteria. However, it is not known to what extent epistatically interacting substitutions occur during non-adaptive evolution. To address this, Ian Gong in the laboratory of Dr. Jesse Bloom (Basic Sciences Division) analyzed epistatic mutations in a pair of protein homologs, one undergoing adaptive and the other undergoing non-adaptive evolution. They found that epistatically interacting substitutions are more common in the protein undergoing adaptive selection, suggesting that the prevalence of epistasis during evolution is linked to the particular pressures driving evolution. As a system for assessing the prevalence of epistatically interacting substitutions in adaptive versus non-adaptive evolution, the researchers assessed the nucleoprotein (NP) from human and swine influenza virus. Humans are relatively long-lived and are likely to be infected with influenza multiple times; thus, the human influenza virus is under continuous diversifying selection for adaptive mutations that promote evasion of acquired immune memory. Human immune memory frequently targets NP through cytotoxic T lymphocytes (CTL), and mutations in protein sequences recognized by CTLs (CTL epitopes) are thus considered to be adaptive changes for human influenza. In contrast, swine are relatively short-lived and unlikely to be infected with influenza multiple times, leading to reduced adaptive pressure. Gong et al. found that the NP in the analyzed human strain accumulated 40 amino acid mutations over a 44-year evolutionary trajectory, while the swine NP accumulated only 18 amino acid mutations, consistent with the theory of lower adaptive pressure on swine NP. The researchers next mapped the known CTL epitopes in human and swine NPs. They found that both proteins contain very similar numbers of such epitopes. Analysis of mutations that became fixed throughout the evolutionary trajectories studied revealed an increased rate of evolution in human but not swine NP in CTL epitopes, supporting the notion that adaptive pressure drives mutation within human but not swine NP. Having obtained evidence for adaptive selection in the human but not swine NP lineage, the researchers next assessed the prevalence of epistasis in each. This was achieved by measuring the influence of individual NP mutations on the viral fitness as measured by the output of viral RNA polymerases from influenza that had been introduced into human cells. Previous work from the Bloom laboratory showed that three individual mutations in human NP each caused drastic reductions in polymerase output but were fixed in evolution due to epistatic interactions with other mutations (Gong et al. 2013). In the present study, they found that no single mutation in swine NP caused a reduction in polymerase output, arguing against epistasis during non-adaptive evolution of swine NP. In contrast to swine influenza, the researchers found that epistatic interactions in human NP are enriched in CTL epitopes, which are expected to be under adaptive selection. These findings shed light on how rare combinations of mutations, particularly involving mutations that are individually deleterious to a protein, can become fixed during evolution. The approaches used by the authors to detect such epistatic interactions may be of broader use to studying protein evolution: "We think that this finding might eventually be of use in identifying instances of strong selection," said Dr. Bloom. "For instance, as new high-throughput experimental techniques allow us to identify what appear to be unusual combinations of mutations, we can then guess that there was some strong selective force involved." Gong LI, Bloom JD. 2014. Epistatically Interacting Substitutions Are Enriched during Adaptive Protein Evolution. PLOS Genet 10(5): e1004328.